If you often grab a plain bagel on your way out the door only to find yourself starving a few hours later, you know that not all breakfasts have the staying power you need. A study published in a 2009 issue of the "British Journal of Nutrition" found that participants who ate a high-protein breakfast, compared to one high in carbohydrates, reported greater feelings of fullness and better regulated their food intake later in the day. A protein breakfast is also beneficial after a morning workout, as the amino acids assist with muscle repair and recovery. Go for the most nutritious breakfast protein options to experience the greatest benefit from adding this nutrient to your morning routine. An egg offers B vitamins, iron, choline and antioxidants such as lutein and zeaxanthin. The cholesterol in egg yolks has very little effect on your blood cholesterol, and moderate consumption has no impact on your risk of developing heart disease, unless you have high cholesterol or diabetes, reports the Harvard School of Public Health. 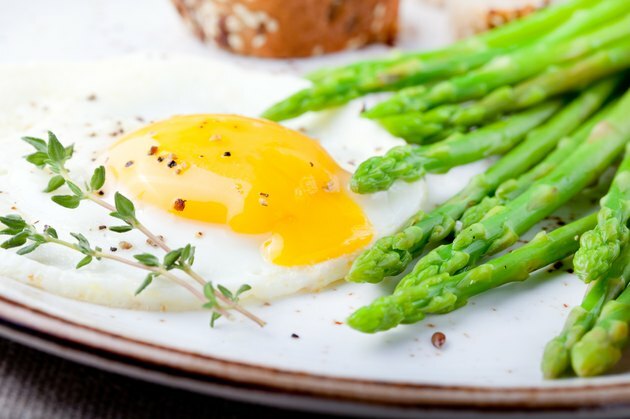 An egg breakfast also helps with weight loss. A study published in the "International Journal of Obesity" in 2008 found that an egg breakfast enhanced weight-loss efforts in participants who were cutting calories to lose weight more than a bagel breakfast of equal calories. One large poached egg contains 6 grams of high-quality protein. Low-fat dairy is a quality source of complete protein that's easy to grab on the go. It also provides you with a dose of calcium, potassium and vitamin D. Plain Greek yogurt offers 17 grams per 6-ounce serving; 2 percent cottage cheese has 12 grams of protein per half 1/2cup; and part-skim ricotta cheese provides 14 grams of protein per 1/2 cup. Eat these with fruit or toast, use them to top whole-grain waffles or to stir into hot cereal. Whey protein, a derivative of milk, offers 15 to 25 grams of complete and highly digestible protein per scoop -- depending on the brand -- and mixes easily into a fresh fruit smoothie. A 1-ounce portion of nuts sprinkled over cereal or eaten out of hand adds 4 to 6 grams of protein to breakfast, depending on the type you choose. Almonds, cashews and pistachios are among the higher protein choices. Nut butter trumps other bagel and toast toppers, such as butter, jelly and cream cheese, when it comes to protein content -- offering 7 grams per 2 tablespoons of peanut butter or almond butter. Nuts contain heart-healthy fats and B vitamins as well. A breakfast that includes peanut butter stimulates the body to release an appetite-suppressing hormone, with the effects lasting eight to 12 hours, a study published in a 2013 edition of the "British Journal of Nutrition" found. Eating peanut butter at breakfast also kept blood sugar levels moderated, even after some participants indulged in a high-carbohydrate lunch. Regularly eating processed meats any time of the day, including at breakfast, is associated with an increased risk of heart disease and cancer, reported a major study of almost 1/2 million people published in "BMC Med" in 2013. This includes typical breakfast proteins such as ham, sausage and bacon. You can still get a morning meat fix, though, by making "sausage" patties with fresh, ground turkey or chicken, minced onion, fennel seeds, oregano, salt and black pepper. A 4-ounce patty will provide about 22 grams of protein. Other unprocessed meats also offer a dose of protein at breakfast time. Try baked flounder -- with 13 grams of protein per 3 ounces -- as a complement to eggs; wrap 3 ounces of flank steak and salsa in flour tortillas for breakfast tacos with about 24 grams of protein; or make a hash with 3 ounces cooked salmon, potatoes and onions to add about 22 grams of protein to your meal. These high-protein options are lower in fat -- with the exception of salmon which is rich in heart-healthy fats -- and chemical preservatives than processed meats. International Journal of Obesity: Egg Breakfast Enhances Weight Loss.